For the third time in five years a player has followed an ATP Challenger title with an ATP World Tour triumph in back-to-back weeks. Pablo Andujar became the lowest-ranked ATP World Tour champion in 20 years on Sunday, beating first-time finalist Kyle Edmund 6-2, 6-2 to win the Grand Prix Hassan II for a record third time. The 32-year-old Spaniard saved seven of the nine break points he faced, converting six of his own to prevail after one hour and 22 minutes. Andujar was World No. 1,824 in the ATP Rankings just two months ago, the result of an elbow injury that required three surgeries. 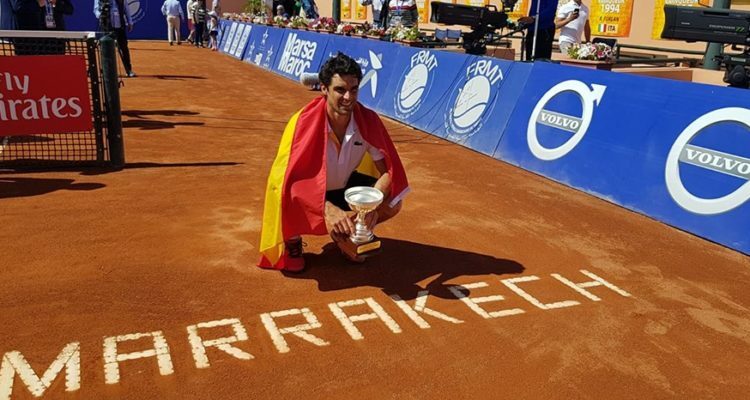 He clinched his first title since 2014 last week on home soil in Villena, lifting the trophy of the Ferrero Challenger Open, and carried the momentum to Northern Africa. Andujar, currently sitting at World No. 355, is now the lowest-ranked tour-level titlist since Lleyton Hewitt (No. 550) prevailed in Adelaide 20 years ago. By taking his fourth ATP World Tour title, the Cuenca native takes away €85,000 in prize money as well as 250 ATP ranking points. On Saturday, Nikola Mektic of Croatia and Austrian Alexander Peya clinched their first team title. The top seeds fought past Frenchmen Benoit Paire and Edouard Roger-Vasselin 7-5, 3-6, 10-7. The final lasted one hour and 26 minutes. This entry was posted in ATP 250 Marrakech, ATP Tour and tagged ATP World Tour, Grand Prix Hassan II, Pablo Andujar.